The election of Donald Trump in the US and the growth of anti-migrant and Islamophobic scapegoating in Britain and elsewhere have left millions of people fearful of the growth of racism. Politicians and the media have ramped up the rhetoric against immigration while Theresa May has put the ending of the free movement of labour at the heart of her Brexit strategy. In a situation where migrants, Muslim women and anyone considered to be ‘foreign’ are being attacked on a daily basis and refugees are being abandoned by Britain and Europe to destitution, drowning and exploitation, there has never been a more important time in recent history to stand up to racism. Thanks to all who joined the Day of Action for the Winter Appeal for Stand Up to Racism, which nationally raised £10,000 for refugees in Calais see the report here – and in Leeds saw a successful ‘Santa Knows No Borders’ event in town which collected £100 for the national appeal and also a fantastic Rock for Refugees gig in the evening – see here. The rise of racism in France, not least the threat posed by Marine Le Pen in next year’s election, underlines the importance of building a mass movement against racism in the UK. In Leeds we had a successful ‘Confronting the Rise of Racism’ meeting on 8 November, and in December Wakefield SUTR held a successful meeting of 50 people in December – and we will hold other such public meetings in the new year in the run up to the massive national demonstration in London on Saturday 18 March 2017 called by Stand Up to Racism and the TUC, which is part of a Europe wide day of action which will see demonstrations across Europe. Leeds Stand Up to Racism meet the first Tuesday every month at 6.30pm, Leeds UNISON, 160a Woodhouse Lane (opposite the Fenton) – next meeting Tuesday 7 February – all welcome. Leeds Students’ Stand Up to Racism also have regular meetings. 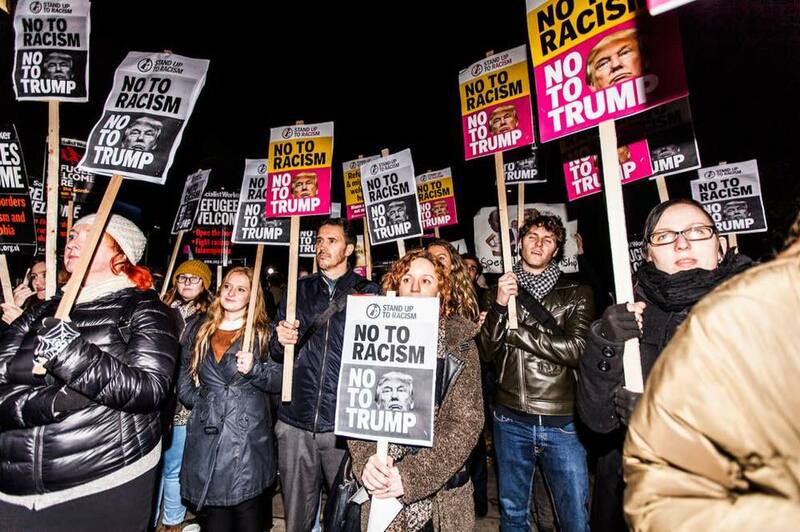 Dump Trump Protests on the day of his inauguration – Friday 20 January – Meet 12noon Parkinson Steps, University of Leeds –called by Leeds Stand Up to Racism, supported by Leeds Coalition Against the War and others. and at 5pm Dortmund Square (off Headrow). Called by a wide range of groups, supported by Leeds Stand Up to Racism, Leeds Coalition Against the War and various other groups. Saturday 21 January – Leeds ‘Women Against Trump’ protest in solidarity with marches in the US and London – meet 12 noon, Briggate. All welcome. Saturday 21 January – ‘An Evening with Muhammad Ali‘ – Leeds Civic Banquet Hall, 3-6pm. See ‘muhammadalileeds’ on facebook for more info. Holocaust Memorial Day – 27 January 2017 – Never Again! More than six million Jewish people and millions of others were killed by the Nazis – Join our vigil to remember the Holocaust – Friday 27 January at 5pm, Mill Hill Unitarian Chapel (City Square). Conference aimed at Trade unionists and local groups to mobilise for 18th March demonstration and plan national antiracist activity in the trade union movement. Leeds Stand Up to Racism Public Meeting – Saturday 25 February. Leeds Civic Hall , Council Chambers 12-3pm Speakers include MEND, MEP Julie Ward, Cllr David Nagle and others invited. In Leeds we have organised coach transport down to make this Anti-Racism Day demonstration the biggest yet, to show that Theresa May does not speak for us when she blames migrants and refugees for the problems cause by austerity and the financial crisis, and that we are united against racism, Islamophobia and anti-Semitism.